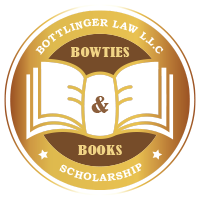 Thank you for your interest in the 2019 Bowties and Books Scholarship. Please fill out the form completely and click the "Submit Application" button. You will be notified only if you are one of the finalists. Attorney Jason Bottlinger and his wife are proud Huskers. Though Jason went to law school in Texas, he came home to Nebraska to start his law firm, close to family and friends. The experiences we have at each school we attend impact the people we become. In a well-written essay, please share why you chose the college you will be attending and/or how you hope that school will influence your future. Copyright ©2019 Bottlinger Law L.L.C. - All Rights Reserved.